Mixed vegetable pomegranate raita is a fantastic raita that can be a side dish for all North Indian main course as well as South Indian. 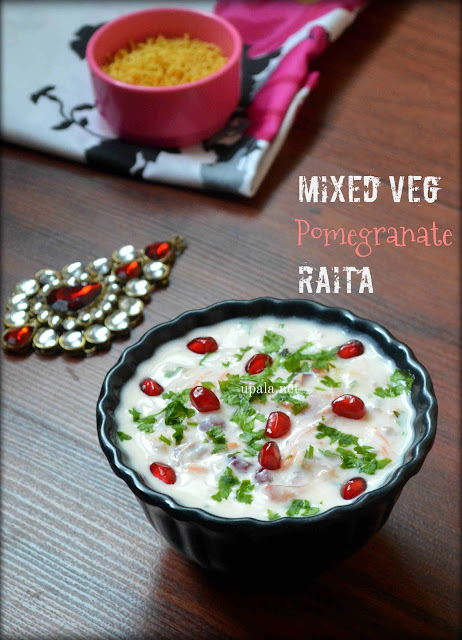 This Mixed vegetable pomegranate raita can give you a mix of all taste and also a better way to include veggies in your kids diet. Be it a chapathi or Mint rice, this raita goes well with almost all the main dishes. Making this Mixed vegetable pomegranate raita is so easy and can be a delightful pair for your main course especially during summers. Basically all the veggies and pomegranate seeds are mixed with a whisked yogurt/Curd which gives a fantastic taste. You can also have this raita as a mid morning snack, a better way to fill your stomach than taking any junk food. Since this Mixed vegetable pomegranate raita is prepared with a mixture of all veggies and good bacteria rich Yoghurt/Curd, it good for your health. If you are interested in exploring other varieties of raita, then check out Strawberry raita, Capsicum Raita, Onion Raita, Amla Raita, Cucumber raita, Bindi raita and Banana Stem raita. 1) Add sugar, salt to curd and whisk well. 2) Now mix Onion, tomato, carrot, cucumber, pomegranate and Coriander to curd. Yummy Mixed vegetable Pomegranate Raita is ready. 1) In addition to above, you can sprinkle few roasted cumin powder and Red chilli powder to this raita to pair up roti, paratha,vegetable rice, basically for all North Indian dishes. 2) You can do a seasoning of mustard seeds and add to raita. This will pair up all south Indian rice varieties like tomato rice, mint rice, coriander rice, etc. 1) You can add few finely chopped green chillies to raita for spiciness.